S​ince the 2003 Waste Emissions Trading Act came into force, the UK government, in collaboration with the waste industry, has actively worked towards the diversion of organic waste from landfill and towards a “zero” landfill economy. Different types of waste classed as “organic” include agricultural waste, such as slurries and manure (~90 million tonnes/year), food and green waste (~20 million tonnes/year) and sewage sludge (~1.5 million tonnes/year) . The assessment and quantification of this organic fraction within mixed waste is pivotal for diversion targets and energy recovery. Renewable energy from waste has an important role to play in tackling climate change by displacing the use of fossil fuels and by providing a more environmentally sustainable method of disposing of residual wastes, where recycling is not practical or economically feasible. Energy can be recovered from waste using a number of processes, including anaerobic digestion (AD), combustion, gasification and pyrolysis; each is capable of delivering sustainable methods of waste treatment and a clean source of energy. The recovery of energy from biomass-derived waste materials is supported by the Renewables Obligations (RO) as a mechanism to incentivise investment in suitable renewable energy production technologies. Where a heterogeneous fuel, such as mixed wastes, is used there is a requirement to understand what proportion of the total energy recovered is from a renewable resource, such as biomass. Work has been undertaken at Cranfield University, funded by TSB/SBRI with Defra and DECC, to develop appropriate methods of assessing the biogenic biomass content of mixed wastes, and the energy outputs from this fraction. This work involved the further development of an image analysis method previously devised at Cranfield University . The methods we developed demonstrate the capability to determine the biogenic proportion of mixed waste materials, and also to reliably estimate the net calorific value (NCV) of this fraction, which is indicative of the energy yield before process efficiency is taken into account. The net energy potential is calculated from measurements of the moisture content, which enhances the accuracy of the method. The moisture content is determined using a novel microwave technique developed by the National Physical Laboratory (NPL). The biogenic fraction of each waste component is determined by carbon-14 analysis, which is a highly accurate method of measuring the ratio of ‘new’ carbon (14C) to ‘fossil’ carbon (12C). The technique used requires an accelerated mass spectrometer (AMS). The sample is combusted to form CO2, which is then converted into graphite by passing over a hot Fe catalyst with H2. The graphite target is then bombarded with caesium (Cs) ions to release C ions. The rapid detection of 12C4+, 13C4+ and 14C4+ ions allow for the calculation of the ratio of 14C to 12C/13C. The developed system can be mounted above mixed waste prior to energy recovery and enables facility operators to determine the renewable energy potential of the input fuel. The imaging technique determines the physical composition of the waste (i.e. % paper, card, plastics etc) and matches the components to the chemical properties (NCV and 14C); thereby allowing for the determination of renewable energy potential from the mixed waste. The relationship of waste composition, net CV and 14C is illustrated in Figure 1. In a recent study this image analysis method was applied to two separate sets of waste samples with the aim of determining both the total energy potential, and the energy potential from the bio-based fraction of the mixed waste material. The waste mixtures were prepared using a known quantity of each component (paper, card, wood etc) and spread out to replicate a typical conveyor belt. The actual net calorific values from the biomass fraction (%bioNCV) of the mixed wastes were 74.7% and 80.1%, whereas the %bioNCV determined by the image analysis method were 70.7% and 79.5% respectively. The values calculated from the imaging method suggest that this technique has the potential to be used in facilities that generate energy through the combustion of mixed waste materials (Figure 2). Figure 2: Suggestion for how the image analysis method might be applied in a waste processing facility. The use of this technique in thermal waste processing companies would enable the operator to understand the proportion of energy produced from the biomass fraction of mixed wastes in real time, and to retain an electronic record for future accreditation. This reduces the requirement to undertake expensive off-site laboratory analysis and reduces the disruption of the operation of the facility. The system could also be of use at waste processing facilities that produce a refuse-derived fuel (RDF)/solid recovered fuel (SRF) [3,4] which would be a commodity sold to a third party for use elsewhere. The properties of the product – in this case the %bioNCV –could be determined prior to dispatch, thus potentially enabling a more dynamic market for the material, with the specific grade and value of the SRF known for each batch produced. Further work is underway to improve the accuracy of the technique and reduce the time required to process the images (currently around 7 minutes). A prototype system, in combination with other work completed with a collaborating company, will soon be tested on a fully operational waste processing facility. Depending of the waste input, composting and AD outputs will be of different qualities. AD and Composting Quality Protocols – PAS100 and PAS110 – were introduced to produce 'end of waste' criteria for the production and use of a waste-derived product without the need for waste management controls. The protocols state permitted input materials, treatment processes and output quality standards. The digestate formed from AD will have different properties depending on the feedstock composition and origin (domestic, industrial, agricultural or mixed) and the process conditions. Different types of digestate possess different physical, chemical and biological characteristics. High quality digestate is rich in organic matter and inorganic nutrients and can be applied to soil as a conditioning fertiliser, in place of synthetic fertilisers. The organic fraction of the digestate is a mixture of fats, proteins, carbohydrates, lignin, amino acids, sugars, celluloses and fatty acids, along with live and dead micro-organisms. Depending on intended digestate uses, it is important to understand and manage any hazards and associated risks to the wellbeing of humans, livestock and the environment, in part as a contribution to securing stakeholder confidence. This includes minimising the introduction (and subsequent transfer to soil and food products) of potentially harmful components, such as toxic elements or pathogens. To do this, auditing processes need to be developed to adequately assess AD inputs and outputs. In addition, digestate use on land can have potentially harmful impacts on the environment (e.g. as a consequence of enhanced nitrate leaching or ammonia volatilisation). These can usually be minimised by following good agricultural practice. The 2009 Anaerobic Digestate Quality Protocol (ADQP) aims to clarify end-of-waste management controls, provide confidence in the digestate quality standards and protect human health and the environment by setting out good practice for the use of quality digestate. The ADQP is a risk management tool that was developed by WRAP and the Environment Agency in conjunction with industry. Cranfield helped to develop this protocol, producing a technical report that defined input material and output quality. The work assessed the effect of the anaerobic treatment process on the hazards contained in the waste and how, through the use of the digestate in a specific end-use, those hazards can be transported to a receptor of concern (environment, human and animal). In practice, several barriers act to prevent exposure. By exploring the efficacy of these barriers we have been able to identify the most significant hazardous agents, wastes, exposure pathways and end uses. The combinations of these factors that pose the highest risk to human health, animals and the wider environment have been identified and highlighted as features that can then be addressed by the AD quality protocol. The work assessed exposure associated with digestates derived from 70 waste input materials processed through 6 types of AD settings and for 7 different end-uses. The methodology adopted the general principles of Defra’s Guidelines on Environmental Risk Assessment and Management [6,7]. The management of exposure pathways is central to effective risk management throughout the process chain from waste input to end use of the AD residue. In practice, critical control points at each stage of the process chain provide opportunities to actively reduce risk. Under normal operating conditions, with the application of good practice, barriers (management measures) can be applied that will effectively guard against exposure to hazards. Rational and, where possible, evidenced judgements about the likelihood and significance of receptor exposure to physical, chemical and biological hazards are coded. Most concern should be given to situations where significant hazards are readily available to receptors (e.g. direct ingestion), i.e. where potent, hazardous constituents in input streams remain unaffected by AD treatment and can migrate through the environment in sufficient quantities to cause harm. Hazard profiles containing a high concentration of animal and human pathogens appear near the top of the table, together with wastes derived from the leather industry containing high concentrations of chemicals. Pathways of high availability have no significant exposure barriers to certain hazards (direct ingestion). The end-uses that received the highest exposure ranking were ready to eat crops and grazing and animal feed as they offer the highest number of available pathways. The matrices highlighted that greater opportunities for exposure to hazardous agents occur with higher contaminated wastes for certain end-uses. These conclusions offer insights into where controls might be most effective; through (1) the exclusion of certain waste types; (2) the application of codes of practice backed up by the quality protocol for specific exposure routes and (3) specific attention being given to certain end uses. The approach explicitly linked expert understanding on waste categories, AD processes and the environmental fate of contaminants in the context of AD product end use and has highlighted the key drivers of potential exposure, providing a basis for control through the ADQP. The composting process relies on the proliferation of micro-organisms to decompose solid organic waste feedstock in order to produce a stable, organic material (compost). However, this process releases these micro-organisms into the lower atmosphere, where they are known as bioaerosols. Bioaerosols can be micro-organisms, including bacteria and fungi or their constituent parts . 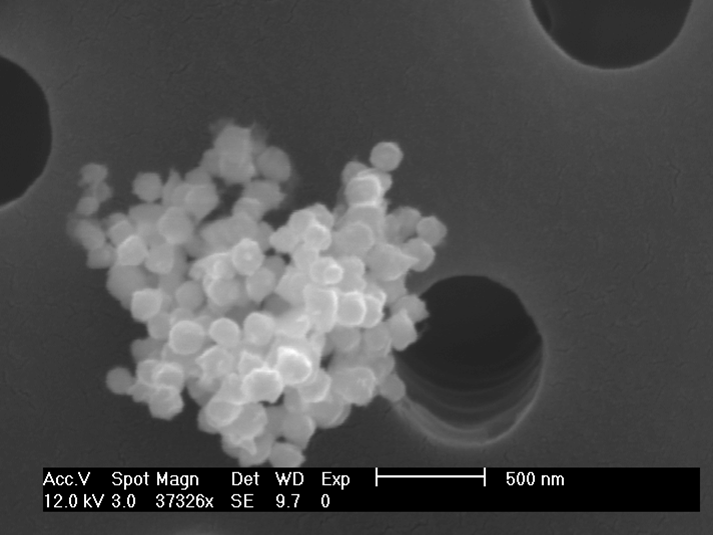 Bioaerosols are sufficiently small (Figure 3) to penetrate into human lungs. Some bioaerosols therefore have the potential to cause health effects, particularly with people who have suppressed immune systems or pre-existing conditions, such as tuberculosis. Waste composting facilities are therefore regulated by the Environment Agency (EA), which requires the site operators to demonstrate that bioaerosols can be maintained below the recommended levels at 250m from the site boundary through a site specific bioaerosol risk assessment . Research is underway to improve the air dispersion modelling techniques for predicting downwind dispersal of bioaerosols from composting facilities. These techniques have been tested previously, but have typically been found to underestimate the downwind concentrations of bioaerosols , probably because monitoring techniques are inadequate. To model bioaerosol concentrations, it is necessary to understand the concentration of bioaerosols released at source (the source term). However, composting facilities, where numerous large vehicles operate, create a health and safety risk for sampling. In addition, research has shown that the highest concentrations are released from compost processing activities (turning, shredding and screening of the material) and not from stationery sources . Most bioaerosol concentration data are therefore taken at least 10 metres downwind of the actual source. Current research is taking samples directly from the composting activities under controlled conditions. It is hoped that this will improve our understanding of the source term. In addition, the data used previously to validate model output  have contained only a limited number of sampling points, due to the labour intensive nature of bioaerosol sampling techniques. As a result of an extensive sampling project [12, 13] a database containing over 300 measurements is now available to validate model output. These data are currently used to calibrate modelling techniques, in order to develop a best-practice modelling protocol for bioaerosols from composting facilities. Remaining knowledge gaps associated with bioaerosols include the lack of a defined dose-response relationship that explains the link between exposure to a certain concentration of bioaerosols and particular health impacts. This is due to the numerous different bioaerosols emitted by composting facilities, but also due to the complex nature of human responses to different bioaerosols. It is hoped that by improving the confidence associated with modelling downwind dispersal of bioaerosols, we can begin to improve our understanding of the dose or amount of bioaerosols that people are exposed to, as a first step to closing this knowledge gap. 3. Wagland ST, Kilgallon P, Coveney R, Garg A, Smith R, Longhurst PJ, Pollard SJ & Simms N. (2011) Comparison of coal/solid recovered fuel (SRF) with coal/refuse derived fuel (RDF) in a fluidised bed reactor, Waste Management, 31 (6) 1176-1183. 4. Velis C, Wagland S, Longhurst P, Robson B, Sinfield K, Wise S & Pollard S. (2012) Solid Recovered Fuel: Influence of Waste Stream Composition and Processing on Chlorine Content and Fuel Quality, Environmental Science and Technology, 46 (3) 1923-1931. 8. Douwes, J., Thorne, P., Pearce, N., and Heederik, D. (2003) Bioaerosol health effects and exposure assessment: Progress and prospects, Annals of Occupation Hygiene, 2003, 47(3), 187-200. 9. Environment Agency, 2010. Composting and potential health effects from bioaerosols: our interim guidance for permit applicants. Position Statement 031, Version 1.0. Environment Agency, UK. 10. SEPA/SNIFFER, 2007. Bioaerosol and Odour Monitoring from Three Composting Sites. Prepared by Drew GH, Tamer Vestlund A, Tyrrel SF, Longhurst PJ and Pollard SJT, SNIFFER Research Project UKPIR12. Available online at http://www.sniffer.org.u. 11. Taha, M. P. M., Drew, G. H., Longhurst, P. J., Smith, R. and Pollard, S. J. T. 2006. Bioaerosol releases from compost facilities: Evaluating passive and active source terms at a green waste facility for improved risk assessments, Atmospheric Environment, 40, 1159-1169. 12. Pankhurst, L. J., The Effect of Green Waste Composting on the Concentration and Composition of Ambient Bioaerosols, Unpublished PhD Thesis, Cranfield University, 2010. 13. Pankhurst, L. J., Deacon, L. J., Liu, J., Drew, G. H., Hayes, E. T., Jackson, S., Longhurst, P. J., Longhurst, J. W. S., Pollard, S. J. T and Tyrrel, S. F. Spatial Variations in Airborne Microorganism and Endotoxin Concentrations at Green Waste Composting Facilities. International Journal of Hygiene and Environmental Health, 2011, 214, 376-383. This article is based on a presentation by Raffaella Villa at the Environmental Chemistry Group 2012 Distinguished Guest Lecture and Symposium held in the Chemistry Centre at Burlington House on Wednesday, March 14th 2012. A biogas plant. The four stages of anaerobic digestion – hydrolysis, acidogenesis, acetogenesis, and methanogenesis – convert organic waste into the biogases methane and carbon dioxide. Reference (for example): Appels, L. et al., Progress in Energy and Combustion Science, 2008, 34, 755-781.